Tree swallows first nested here in the early 1990's. 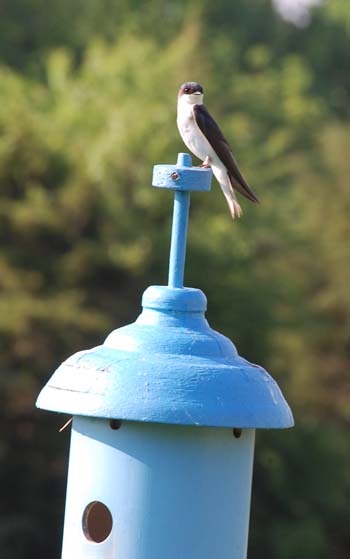 We are only a mile or two south of the Mason-Dixon line, just south of the tree swallows' reported breeding range. When two pair used bluebird boxes that first year, friends in the north predicted that our bluebirds would be in dire trouble in future years. 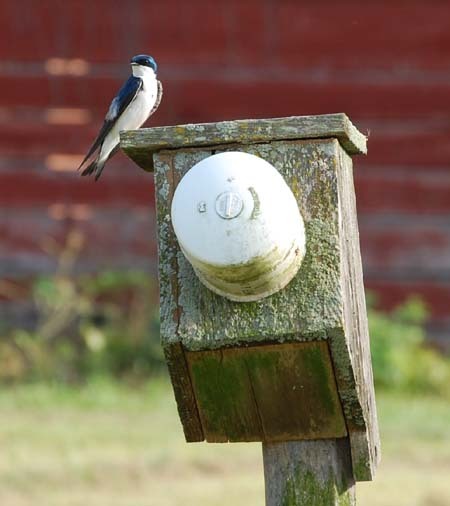 The tree swallows did return in greater numbers each year, but seem to have little effect on our bluebirds as long as more nestboxes are provided. There are a few skirmishes between bluebirds and tree swallows competing for the same nestbox each spring, but no more than between two pairs of bluebirds. The tree swallows often do seem to gang up on a single pair of bluebirds, but the outcome is often in favor of the bluebirds. 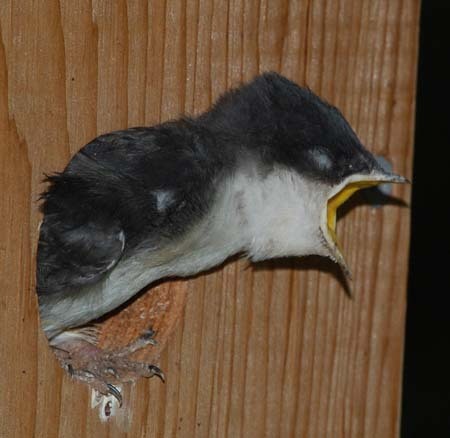 Also, bluebirds often get a preferred tree swallow nest for their second brood after the tree swallows fledge. 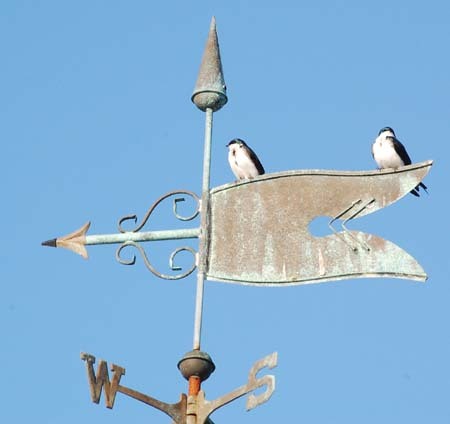 However, tree swallows appear to sometimes have two broods here, contrary to the literature and to what others have reported. Perhaps their earlier arrival this far south allows a second brood. We now have around a dozen adults flip-flopping between nests, so it's impossible to tell who is who. The second nestings could actually be renestings after a failed first attempt elsewhere on our property or off. There is usually only one of these each year and it has been by an adult female, rather than a second year bird. The females with immature plumage often take the place of a lost female and very quickly begin a new nesting with the surviving male. I witnessed this once after a house sparrow had killed the female of a nesting pair in our yard. We noticed that our tree swallows were bringing white chicken feathers from rather far away to line their nests and began offering feathers at nesting time. This was a really big deal for them. A florist's frog was used in a can to hold the feathers. The tree swallows did pose a problem in the early years by claiming martin gourds. 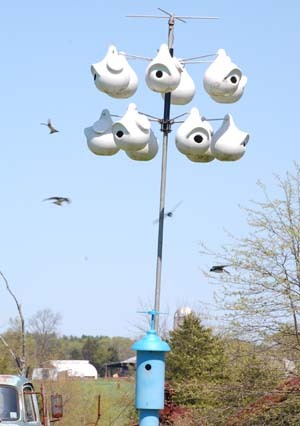 It was suggested that we place a tree swallow box near enough to the martin gourd rack that the pair using this box would defend the immediate area, including the gourds, from other swallows. This has now worked for many years. Also, we make sure there are enough boxes for everyone. 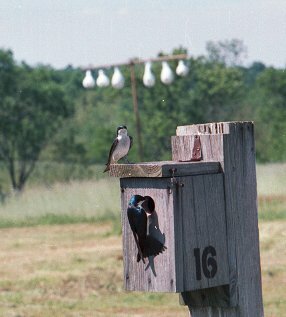 The tree swallows also get along fine with our barn swallow colony. The two species, especially fledglings, are often seen perched side by side on the power line behind the house. 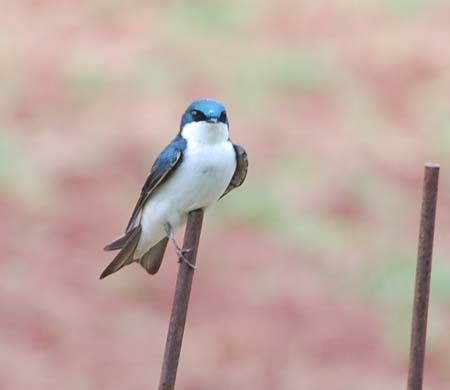 In addition to catching insects on the fly, tree swallows frequently hunt from low perches, and appreciate the provision of these perches as much as bluebirds do. They are often seen perched on the tomato cages where they benefit from the untainted insect population in our organic garden. &COPY; 2001 - 2013, American Artifacts and Richard Van Vleck, Taneytown, Maryland.